2016 has been one hell of a year for Karen Brown. In January, she was named as the Female Coach of the Year by the FIH (Fédération Internationale de Hockey) for her phenomenal achievements since her coaching career began. Follow that 8 months later with her Team GB winning Olympic Gold in Rio and I think you can safely say she is one very happy coach! Karen is Great Britain’s most capped female international player, amassing 355 caps in a storied and successful international career. She competed in three Olympic Games collecting a bronze medal in 1992 to add to a European Gold (1991) a Commonwealth Games silver and of course numerous medals in her club career with Slough, UK. 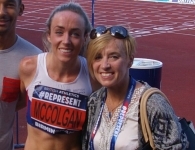 She began her coaching journey at Chelmsford back in 2000 leading them to a European Cup Winners Cup silver medal and the national indoor title. She has worked with the England U16, U18 and U21 and B programmes. She was Head Coach of the England U21 women’s team at the Junior World Cup in Chile in 2005 and joined England Hockey that same year as Junior Performance Manager, moving to Assistant Coach working alongside Danny Kerry in 2006. Since then, she has been part of the coaching team that has led England to medals at the World Cup, Champions Trophy, Commonwealth Games and European Championships. With Great Britain, she coached the side that finished sixth at the Beijing Olympic Games, a bronze medal at London 2012 and of course the Gold medal at Rio 2016. If you missed it, have a look at the video below of a recap of the Olympic hockey final against the Netherlands and that fantastic winning penalty scored by Hollie Webb. MEET KAREN IN PERSON AT OUR UP & COMING FEMALE COACHING CONFERENCE! Can you talk us through the emotions and thoughts that were going through your mind during the infamous penalty shoot out - and how you felt when Hollie Webb put away that penalty to win Gold? I’ve been asked that a few times. It’s really interesting because I was standing next to the 5 athletes and the GK Maddie, all of us were amazingly calm, I think the players and myself just knew we were going to win. I remember one of the athletes, I think it was Alex Danson, looking at the Dutch Team before it all started and she said, “Oh my god, look at them, look at them, they ‘look scared stiff “. We had worked an awful lot on what it would feel like if we were in this position, how we would want to be and what environment we wanted to create amongst the 6 of us. It was knowing in advance what we would be saying to each other, how we would react, whether we scored, whether we didn’t score. We spent a lot of time on ensuring that we were consistent in our processes. And because of that, I think the girls had an awful lot of confidence. It wasn’t just technically whether they could execute their skills, it was also emotionally being able to control their emotions. Honestly, they weren’t over hyped or anything like that. It was all very calm. It was much calmer than we were at the Europeans a year ago, much more chilled. I don’t know whether that was because some of them had been through it before at the Euros. There was no doubt they had a lot of confidence in Maddy [Goalkeeper], absolutely no doubt. I remember I looked at Holly [Webb] before the penultimate Dutch penalty, she was hanging on my left shoulder and I squeezed her and said, “You realize if Maddy saves this,”(it’s not if she misses, the words were very carefully chosen) ‘If Maddy saves this, you’ve got it to win Holly.” She just went, “Yeah, not a problem, I’ve got this.”She said that before Maddy had made the save, I remember thinking as Holly walked up [to take the final penalty], “Even if she doesn’t score she won’t let herself down, she will do well.” That was the view the whole team had; “We’ll do our best and if our best is good enough that’s fine.” That was the attitude that they were taking into it. It was interesting reflecting on the experience because I genuinely felt calm and ready for it. It’s what we’ve trained for to take shuttles to win Gold. The moment it went in, I just remember leaping up in the air and then thinking, “Don’t run with them. Don’t run because you won’t be able to keep up!” I went back to our coaching staff, because we’re a team as well. I wanted to be with the coaching staff. There was a lovely image of you hugging Danny Kerry [Head Coach], and I thought, "That says it all, really. Doesn't it? All the work has paid off." Yeah, it is a job well done and we planned absolutely, meticulously for Rio. We called the whole project ‘8-13’. 8 matches in 13 days. That’s what we have to achieve if we were going to win a medal. We looked to every area and every member of the management team had areas of responsibility and we all had confidence that they could deliver on those areas of expertise. What was it about the 8-13 project and your plans for Rio Gold that were different for your preparation for London 2012? You had a successful games there winning a bronze medal, but what was it this time that meant you could go all the way to winning? We had a very experienced playing group and a very diverse but extremely experienced management team. There was only one person in the management team who hadn’t any previous Olympic experience. Some athletes had got numerous Olympic cycles under their belt and I think that really helped. But I really don’t think that there’s a golden nugget that we could say that’s why we won. During the Games, the momentum builds and the belief builds. There is no doubt staying undefeated and winning helps everything, everyone stays confident and relaxed, small things don’t become big. We kept the processes exactly the same for each game, as coaches we never ask players to do anything we didn’t think was within their skill set. We knew our opponents inside out. We knew, we were very confident. It was a great dynamic amongst the coaching group. Everyone played their role and that was, I think, one of the keys of success. Danny was heading it up and he did that brilliantly, but he allowed everyone to have a full contribution and do their role with no one trying to do someone else’s role, which can happen when the pressure is on. We approached every game the same. We debriefed every game the same. Everything was forward looking to the next game. Can you talk to us about your role as Assistant Coach during the Olympic Games in Rio - did you have any specific tasks in the lead up or during the two weeks of the Games? I look after the majority of our defence work as well as one of my main roles during the Games is scouting opposition. Myself and Craig Keegan the other Assistant Coach prepare a presentation to Danny of what the opposition will do, we then would discuss our tactics and the pros and cons of what might happen, on some days this lasted 2- 3 hours, then Danny gives the tactics to the team. During the actual matches, my role was to get the substitutions right and work out how we get the maximum amount out of our players for those 8 matches in 13 days. Things like working out how our long our key players need to rest etc. Danny would watch from the stands and send messages to me such as, ”We need more pace down our right hand side and it would be my job to make sure we could deliver this within the player group. If you over play your athletes they will fatigue, and if they fatigue they’ll make errors, all the key matches are at the end of a tournament so the fresher the players are the better they will play, it’s a delicate balance as you have to make sure you get to the knock out stage. The bench is an interesting place, players are coming and going at regular intervals, we have spent a lot of time over the last 2, 3 years understanding each individual player and creating the environment that they want on the bench. Some athletes need a quite word, some of them just want to be told what to do, some want to be light hearted etc, so you need to understanding what works for each individual athlete, as well as what works for the team. Basically they like the coaches and players to be calm and relaxed they believe this gives them the best chance to play well. Craig Keegan and I who run the bench try and control this and given the circumstances and pressure of the Olympics I think we did a pretty good job! How does this coaching achievement for you compare to winning an Olympic medal as a player yourself back on 1992? I think they’re all different and that’s how I view them, rather like not comparing your children! If you’re asking me to compare the medals won as an athlete and as a coach then the best I can come up with is as an athlete, the sport is all about you and how you perform, its quite selfish, whereas being a coach, you’ve got to be pretty selfless and put the athletes first in everything, it becomes very consuming. I have to say to work in a program that created a great cultural environment, that pushed athletes further then they thought they could go, making them believe that they could win is very rewarding. Also with the Rio squad, I am incredibly proud of how the athletes have become such great role models for Hockey and for women’s sport and the acclaim they are now getting from the general public is something that they richly deserve. What are your thoughts on the lack of female coaches involved at the top level at Hockey? During the Rio Olympics, there was only one female Head Coach that being Alyson Annan of the Netherlands Team who you played in the final. I think the associations around the world are aware of the issue of a lack of female coaches within the game. I think that will change over time. Since the game went more professional (which it has done in the last 8 years) we will see a lot more players retiring and wanting to be a coach. Someone like the GB Captain Kate Richardson Walsh wants to go on to be a coach and I see no reason why she couldn’t be coaching a National side in the future. The more role models there are, the more that it will change. People do see it as a career now so I do expect more female coaches in the coming years. Have you had any issues yourself being one of the few female coaches? There is no doubt, that at times it is challenging. Being an ex-player has helped me and I have been coaching the national side for the last 10 years now so my reputation in the Game is reasonably good! However, in Rio as we progressed through the tournament we attracted a lot more media attention and a couple of times I was spoken to as if I was the press officer! I do think it will change and change quite quickly. Alyson getting the job of head coach of Holland is a really good example of that. I do think there will be more female coaches heading up into national sides in the next 2 to 4 years. I stress again the need for role models and people aspiring to do this work, I think some of the players that retired around the London cycle will start drip feeding into various International Coaching set ups in the coming years. What would you say to female athletes who are coming to the end of their career and considering becoming a coach - would you recommend it as a pathway? I would say ‘Don’t do it too quickly, go away and learn the art of coaching first.’ When you’re a coach, you don’t know what you don’t know and therefore you think that you’re going to pass on your knowledge to people just like that and they’re going to listen. Coaching is way more subtle than that and way more powerful if you get it right. There is no doubt in my mind that if you’ve been involved in international programs, especially for a number of years, you have a big advantage over people who haven’t. When it comes to elite performance sport and to have longevity you’ll have to swim really quickly with the tide to stay afloat. It’s like any profession to get to the top is not easy and there are very few international coaches in the World. For example, Danny Kerry has been working with the senior women since 2004 and he is likely to be there for a good while longer, so not may people get that opportunity. There’s lots and lots of people underneath the top job who aspire to do that role and think they could do that role. Some ex-Players will definitely have an opportunity, they just need to learn the skill sets and be able to apply it effectively. The danger is if they get offered a job too quickly and they’re not allowed to grow and develop as coaches and individuals. You get found out really quickly at the highest level, Hockey now is big business we have to deliver medals that’s our job, and that’s a demanding environment. Is it a goal of yours to be a Head Coach of a National Team one day, even if that means leaving GB? No, I have never ever had any desire to be a head coach. The reason for that is I see my skill sets as much better suited to am assistant coach. I see my job simply, its to make the head coach in the program look good. I have no wishes, or desires to be a head coach. That’s just me. That’s me as an individual. I was pretty similar as a player, I didn’t want to be a captain. I wanted to be the best assistant coach I could be, but I’ve never felt the urge to want to do the senior role. That won’t be the direction and next step for me. I realize that’s a little bit unusual, colleagues, and friends, and people that I work with don’t understand it. There's a massive difference between a head coach and assistant coach. I think people forget how big the difference really is. Yeah, I agree with that, I believe that. I think you have to have a transition plan in place and you have to have people within your working environment to replace people when they leave the sport, especially as they can go quite quickly. I still believe there is a place for someone like me to support the program and to support the head coach. I would prefer to do that, from more of a back seat from behind the scenes rather than putting myself forward at the front of it. Are you looking forward to Tokyo now? We have a trial period between October and November and then the central program runs as normal in January. Obviously we have some players that have gone overseas for a bit of a sabbatical and they’ve gone with our blessing, but with certain criteria on that. We’re in discussions at the moment about what the coaching will look like. Some people have already moved on and people review and reflect on their roles and what they’re doing, and how they’re doing, and I’m no different. I’m certainly not saying I’ll be doing this role in 6 months time, but I’m not planning on stepping away from elite sport. I’m looking to explore other opportunities. I’ve done this role for 10 years and I’m looking to expand a little bit, and just change what I do. That could be within hockey, it could be within other sports but I don’t see myself going overseas, that’s for sure. Hello Karen…….maybe you remember a teacher from Burnt Ash Junior school…..Mrs Turpie ( Carole) ……you were a wonderful pupil and a great centre and captain of our winning netball team . I have followed your achievements with no lack of surprise . Just thought I would say Hello .I am of course retired and live in Brittany now . Well done a thousand times .